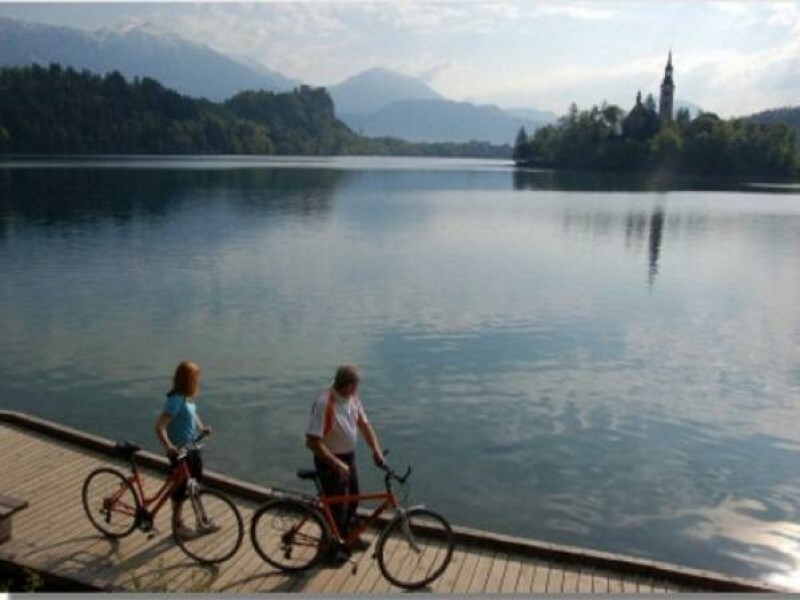 Experience the best of Slovenia on this self-guided cycling holiday from Lake Bled to Piran. Swim in crystal clear mountain lakes, admire majestic mountain ranges and stroll through colourful old towns. Take a break at “The Triple Bridge” in Ljubljana, Visit the Postojna or Škocjan caves, and see the famous Lipizzaner horses. Relax with a cappuccino in the famous Piazza Unita in Trieste and experience a unique stay on a vineyard, where you can try the Teran wine. You will arrive in Bled, a world famous town on the shore of a beautiful glacial lake. Defined by its unique island church sitting proudly in the middle of this immense body of water, surrounded by towering alpine mountains, and the castle perched high on a cliff standing guard over the town, Bled is one of Slovenia’s most popular tourist attractions. An easy descent into the valley. Accommodation in 5* spa-hotel. You will be taken by bus up to the high plateau at Pokljuka. From here you can marvel at the stunning views before gliding down into the neighboring Bohinj Valley, the jewel in the heart of the Triglav National Park. You will cycle through the many small alpine villages scattered across the valley until reaching the small settlement of Ribčev Laz (Fisherman’s Pass) lying next to the stunning Lake Bohinj. Wedged into the corner of this dead end valley, Bohinj is the largest and deepest lake in the national park, and is surrounded by shimmering mountain peaks. The view across this lake from the bridge at Ribčev Laz is unrivaled. Cycle around the lake to Savica Waterfall, source of the Sava Bohinjka River, and then take the cable car up to Vogel Mountain for a spectacular view into the Bohinj Valley and of Mount Triglav, the highest peak in the Julian Alps. Explore the forests surrounding the lake before spending the evening in one of the cosy village pubs and trying the local home made honey Bračdy. Cycling downhill, at the foot of Mount Triglav. Triglav National Park, very peaceful area. Leaving Bohinj you cycle to the lovely village of Bohinjska Bistrica, where you can admire the picture-perfect backdrop. Then it’s up 750 m/2400 ft to the Jelovica high plateau (a “help out” lift to top of mountain pass is available for this part of the trip at extra cost of 20 EUR per person). From the top the route takes you through a deep forest which soon drops off into the Selška Dolina Valley leading to the Škofja Loka hills. The first stop is at the little alpine village of Sorica, set among low green hills. This is the birthplace of the famous Slovene painter, Ivan Grohar. As you ride into the village his statue will greet you. Visit his gallery where you’ll find a limited collection of his work. The next stop is at the historic iron-smelting town of Železniki, where you will find the remains of an old blast furnace dating from 1826. Stop in one of the village inns along the way and try the delicious trout. Finally you arrive in the wonderful town of Škofja Loka, one of the oldest towns in Slovenia. If you are not too tired you can cycle up to the castle on the hill overlooking town. Spend the rest of the evening wandering through the old streets of this historic medieval town. Once settled into your hotel, you will visit the historic old town of Ljubljana and marvel at the ornate, old-world architecture and lovely “fin de siecle” mansions. Then it’s a short walk or ride up to the mighty Ljubljana Castle, perched high on a hill and standing guard over the old town and city center. From its tower you get a commanding view of Ljubljana’s heart and soul. As the sun goes down you can choose between relaxing with a drink in the many outdoor bars/cafes beside the Ljubljanica River, or take an evening stroll, enjoying the lights and viBračt sounds of the city and its charismatic people. Or perhaps do both! A nice easy first day across the historic and richly diverse plains surrounding the capital. As the morning sun begins to rise high in the sky, you will be cycling across an immense 160-square kilometer marshy plain. The Ljubljansko Barje was once a great lake until it dried up 6000 years ago, leaving behind an incredibly diverse landscape that is now home to some of Europe’s rarest forms of bird, plant and insect life. limestone dolomite plateau, and visit the remnants of the world’s highest railway viaduct in Borovnica. and an interesting exhibition of Tito’s cars. Hilly day, side roads. A slightly more demanding day over gentle hills, forest roads and a typical Carst polje (field). Accommodation in 4* hotel. On this day the roads will take you away from the main tourist routes and off the beaten track. You will experience the real Slovenian countryside as you cycle past the beautiful Slivnica Mountain and the intermittent lake of Planina, and marvel at the wonders of this vast world of limestone. You can stop for a picnic lunch in the Rakov Škocjan nature reserve, where the Rak River has carved out a stunning gorge containing some of nature’s most incredible landscape formations, including two natural bridges. Hilly, one long descend afterward. Accommodation in 3* guesthouse. So far nearly 30 million tourists have visited this stunningly beautiful underground Postojna cave formation, carved deep into the heart of the limestone hills. This is the most extensive cave system in Slovenia, covering a total of 21 kilometers. The 1½ hour tour will take you through a fairytale world full of large and colorful stalactites and stalagmites, not forgetting the unique “human fish”, a mysterious creature that lives in dark pools inside the caves. You can also take a short detour to the impenetrable fortress of Predjama castle, wedged tight into a crevasse halfway up a 123-meter cliff-face protruding dramatically into the surrounding basin. Here lived a vivacious and daring knight. Erasmus kept a whole army at bay by utilizing the secret of the Predjama Caves to sneak out for supplies, which included freshly picked cherries which he used to throw at his adversaries to taunt them. Take the tour and learn how Erasmus met his untimely demise in less than poetic circumstances, as he was literally caught with his pants down. First stop is perhaps at the botanical garden in Sežana, then it’s on to the stud farm of Lipica, where you can visit these beautiful thoroughbred Lipizaner horses whose glistening white coats and gentle, graceful dancing have earned them a worldwide reputation. The history of the Lipica horses is closely linked to the Vienna riding school. Take a tour in a traditional carriage, watch them perform and visit them close up in their stables. This will be a day to remember. If you have the time for a couple of side-trips, you can also visit the unusual but very interesting “War Museum” set in the village tower of Lokev. If you skiped Postojna caves – this morning you can visit Škocjan Caves – no less interesting but way less frequented Karst Caves – even listed as UNESCO natural monument! You can take a diversion into the Italian town of Trieste – once an important port with its worldly flair and wonderful atmosphere. Visit the castle, cathedral and Piazza Unita central square. Trieste was once part of Slovenia whilst under the rule of the Austrian monarchy. Relax with a cappuccino in the many old-fashioned cafes. Cycling along the coast there is time to stop for a gelato in old town of Muggia or relax on one of many beaches. The daytrip ends in a climatic resort of Ankaran, back on Slovenia side of the border. Cycling along the coastal road on new cycling path following former railway line. Enjoy great vistas of Slovene coast and Trieste Bay. A coffee stop in fashionable resort of Portorož is a must. The trip ends in the gorgeous Venetian little harbor village of Piran. End of trip after breakfast, or extend the trip with our Istrian Coastal Tour. We recommend flying to Ljubljana airport to reach the starting point of this cycling holiday. The Lake Bled to Piran cycling holiday includes the daily transfer of luggage to the next hotel and local support if required. This cycling holiday uses quality crossbar and unisex hybrid bikes. Each bike is equipped with a comfortable saddle, Shimano components and puncture-proof tyres to ensure that you have an enjoyable cycle tour. The bikes feature modern V-brakes, bottle holders, computer meters, adjustable seats, aluminium frames with mudguards and a rack for a supplied waterproof pannier. Bike are maintained systematically in the workshop on a regular basis. You will receive an accessories package including a bicycle pannier bag with a 10L capacity, repair kit, lock, key, and air pump when you collect your bike. Prices advertised on the website include standard bike hire (unless stated). Colour and specification may vary from the image shown. When you make a booking with us, we take your height(s) and the appropriate bike frame size is matched up accordingly. Why not upgrade your cycling experience to an E-Bike (Electric Bike)? Using a power assisted bike is a great way to go on a cycling holiday and will help you smooth out inclines or longer days in the saddle. Each electric bike features a detailed LCD display, removable batteries for easy charging and assistance up to 25 km/h with a range of around 80 km for each full charge depending on usage. THE HOTEL LISWE WILL CONFIRM THE EXACT HOTELS PRIOR TO ARRIVAL.T BELOW IS SUBJECT TO CHANGE AND SHOULD BE USED AS A GUIDE.